The burger: Some might say that Victory 44 is exercising a bit of presumptiveness when its menu hails the "Perfect Burger." But the safer argument is that it's all about certitude, because this is one excellent burger. For starters, it's proof positive that pork belly truly improves everything it touches. That fatty meat isn't a garnish, it's an integral part of the sublimely juicy patty, an ingenious composition that meshes beef and pork. The meats are ground together in roughly a four-to-one ratio, infusing each two-handed bite with a richness not normally associated with lean ground beef. The well-seasoned patty is thick and jagged-edged, and it gets a dark, flavorful char on a flat-top grill. From there, chef Erick Harcey sticks to a fairly simple and surprisingly disciplined regimen. The golden potato-enriched buns are anyone's idea of a perfect hamburger bun. No wonder, they're from Patisserie 46, source of all things magical in the flour and yeast universe. They're toasted and swiped with a gentle Dijonnaise. Size-wise, patty and bun are a perfect (there's that word again) match. The bottom half is neatly covered in a layer of crunchy, teasingly tangy icebox pickles, which follow a beloved Harcey family recipe. The top of the patty is crowned with two burger classics: a pair of crisp bacon slices, trimmed to pancetta-like skinniness, and two melting-down-the-sides slices of American cheese. You read that correctly. No four-year aged Cheddar, no oozy brie, no funky Roquefort, no artisanal Gouda, just a plain-old supermarket dairy case staple, the kind that Kraft sells in individual wrappers. It really works; anyone raised in a Betty Crocker household will instantly associate this mild processed product with burgers, so why not go there? Take a single bite, and you'll agree: the name fits. Price: $15. However, during happy hour (5 to 5:44 p.m., daily, and repeated from 8:44 to 10 p.m.), Harcey cuts that in half, a move that has to rank right up there as one of the Twin Cities' can't-be-beat burger bargains. There's one caveat: Each $7.50 burger must be accompanied by a beverage purchase. That could be a soda, or a cup of coffee. Or a beer. Fortunately, the bar has a well-practiced knack for rooting out small-batch brews. The taps change almost daily, but there’s almost always something from Bauhaus Brew Labs and Fair State Brewing Cooperative. Fries: Yes, a monster pile of them. Those who prefer their French fries straight-up should take a second look at Harcey's approach: a double turn in the fryer, a brush of bacon fat, a shake of finely chopped fresh herbs, a dusting of bacon powder and a flurry of grated Parmesan cheese. To say that I find these long, golden lovelies difficult to resist is an understatement. A note to readers: Today’s Burger Friday is a greatest-hits recap of an earlier edition (revised to reflect changes at the restaurant, and with the burger), first published in Oct. 2013. 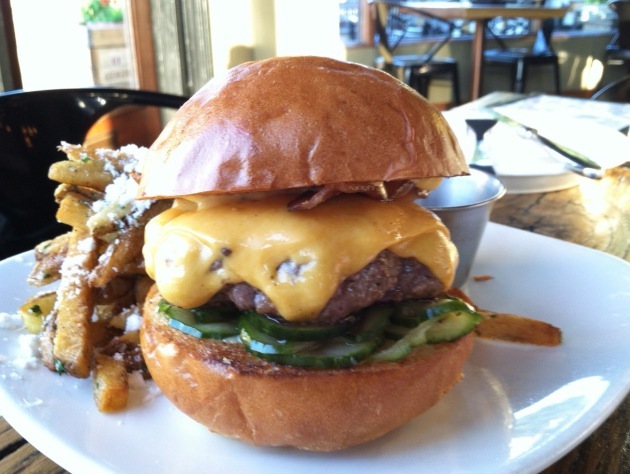 We'll be back to our regularly scheduled Burger Friday (a visit to St. Paul's Highland Grill) next week. Address book: 2203 44th Av. N. (at Penn Av. N.), Mpls., 612-588-2228. Brunch served 8 a.m. to 4 p.m. daily, dinner served 5 to 10 p.m. daily.